Colorized version of the main entry hall. 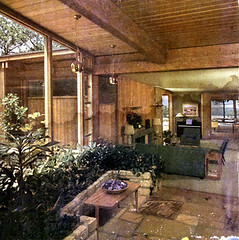 This colorized image of the Entry Hall of Harris Armstrong's Stockstrom Residence has been scanned from a water damaged magazine. The original photograph for this image was black and white. In preparing the image for publication, the colors where applied by hand as part of the printing process.